Blame the brutal winter winds or the pollution, but dry hair really goes through a rough time in this season. However, there are a few products you can use, that will help you show some TLC to dry hair. Picking your shampoo would be the first step. Finding a shampoo that gently cleanses your hair, while taming the frizz could be a little challenging. But before we dive into that, let’s take a deep breath and explore a list of other products that you might need to repair dry and damaged hair. If your hair has gone through heavy chemical treatments, you can be sure that it will need some moisture and care. Vedic Line’s Hair Tonic with Keratin and Rice Protein renews damaged hair to make it stronger and smoother with repeated use. Add a few drop of this product to your hair and then rinse off with shampoo, do this once or twice a week to see results. Damaged and curly hair that is difficult to maintain and to untangle, makes this next product a lifesaver. This hair mask by Schwarzkopf repairs each strand without leaving any residue and reducing the chance of split ends. It also smoothes unruly hair to make it more manageable all while leaving your curls feeling loved. Severely damaged hair that needs round-the-clock hydration will require a leave-in conditioner. We suggest going for one made with 100% natural ingredients like Juicy Chemistry’s Amla, Apricot & Almond leave in conditioner. It softens hair and brings back its body and shine. Simply use it on towel dry hair and style as you like. Dry hair can be caused by repeated colouring too, which is why you need to look after hair that has been coloured. Brillare Science’s Shampoo Colour Protect has grapeseed oil, which is a natural cleanser and antioxidant that it gently cleans coloured hair while protecting it from fading. Dry hair tends to break easily which constitutes hair fall and frizz. Using a serum like Organix Coconut Milk Anti-breakage helps to mend split ends, damaged hair and cuticles. Its keratin proteins and coconut milk formula strengthens hair and reduces damage caused by weak and brittle hair. 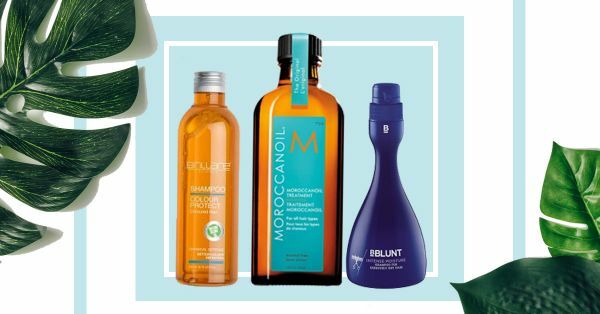 When it comes to hydrating the hair and the scalp nothing works better than regular oil treatments especially if you use Moroccanoil. Its formula helps to maintain and restore any lost fatty acids, omega 3s and vitamins in your hair. Many who have used this product vouch for it saying their hair is healthier and shinier after repeated use. Always have a shampoo and conditioner that is specifically made for dry hair, if you have this hair type. Dry and damaged hair needs hydration and it is imperative to pick the right shampoo specifically. Following that with conditioner is a no-brainer, but shampoo is where it begins. You need to make sure you use a shampoo that does not strip your hair of its natural oils while it cleanses your scalp. Here are a few shampoos for dry hair that we thought would be great! Infused with silk extract this shampoo makes hair smooth & soft. This is recommended for chemically rebonded, smoothened or straightened hair! This shampoo hydrates and gently cleanses your hair for a soft, smooth look. This shampoo contains a moisturising complex enriched with Jojoba, Vitamin E and Wheat Germ Oil which basically lends moisture to and tames unruly undernourished hair. This is perfect to use with colour treated hair. If you are looking at going au natural, this could be the one for you. It activates hair roots, aiding hair growth while cleansing and moisturising it. This shampoo helps you bring the results of a hair spa home. The formula is infused with hydrating marine minerals to deeply nourish your scalp. This shampoo has an extremely light texture, which doesn't weigh your hair down. Giving you silky and smooth tresses. This is formulated with liquid sea-collagen that cares for your hair giving it volume without weighing it down. It works by reconstructing hair fibre to repair the damage. We hope our list helps you get the hair of your dreams!